This series will allow the listener to learn useful vocabulary and phrases which are needed while on a typical eight-day vacation in a foreign country. 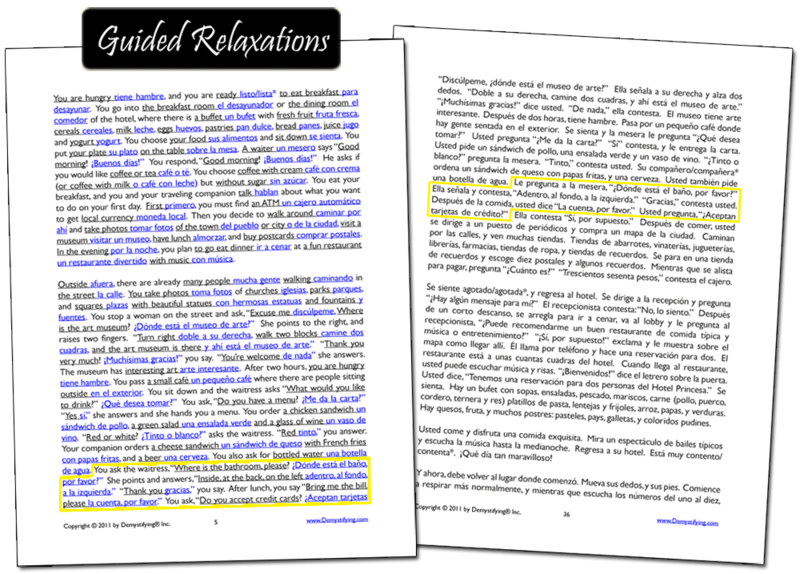 Each of the eight 15 to 30-minute guided relaxations is presented first in English, alternating with key terms in the target language. The entire text is read a second time at the end, using only the target language, for complete comprehension. The background music used in this program enhances learning and activates the right hemisphere of the brain, for long-term retention. Each day’s imaginary adventure has a written text that can be followed. Ideally, the series should be listened to with eyes closed, in a relaxed setting. These audio adventures are ideal for beginners as a learning tool, and can also be used by people who already know the language and wish to review travel vocabulary to re-tune their ear to the target language. An innovative series that can also be used as a relaxation / stress reliever, with the same benefits as meditation. •	MP3 audio download: approximately 3.5 hours of audio in English and the target language. •	Approximately 2.7 hours of audio in the target language only. 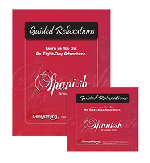 Optional $20.00 soft cover printed booklet, sold with the Guided Relaxations audio program. These twelve lessons, which include books, games, and support materials, cover at least 2000 words. That equals the full vocabulary range laid down by the Council of Europe for social and business purposes. With this CD program, you will learn the equivalent of the material studied in the first one and one half to two years of high school or college. * A 200-page book with a 12-act radio drama play as your text. * Full explanation on how to use the self-study program. 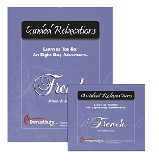 * Twelve CDs with classical music and voice for faster learning. * Games and support materials. Price: $275.00 includes shipping in US and Canada. 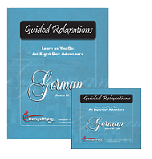 Package With Demystifying® Guided Relaxations - Learn As You Go: An Eight-Day Adventure plus soft cover booklet. Price: $325 includes shipping in US and Canada.